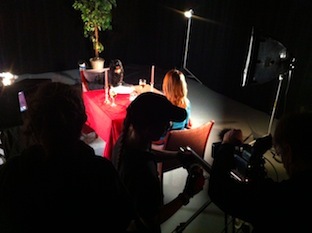 Alt Gobo was invited to help shoot another PSA spot for Women in Film and Video’s Image Makers program. This year the chosen client was Dachshund Rescue of North America. The star of the spot was Edgar, a long-haired black-and-tan Dachshund adopted last year from DRNA by a Washington DC couple. Please click here to view the finished spot. The Image Makers program takes a diverse group of high school students and allows them to explore careers in film and television by pairing them with professional members of Women in Film and Video, a professional association of television and film professionals in the Washington DC area. They gain hands-on production experience while producing public service announcements for local charitable organizations. It helps foster the next generation of filmmakers while helping the local community. The program is taught over the course of eight Saturdays and concludes with a show where each of the finished PSAs are presented to the non-profits. In one session Peter Roof and Kathi Overton gave the students a “Five Minute University” class in lighting, camera, and sound. In this production Alt Gobo provided the HPX170 DVCproHD camera and lights with Peter Roof on camera. Sound was provided by Kathi Overton who also assisted on lighting and camera. The location was Studio B at Interface Media Group in downtown DC. Alt Gobo used the Glissade®, a 1-meter camera slider of its own design since dolly and trucking shots were used throughout the production.